As most audio players, you can start it in your file manager, but differently from the others, you can choose the audio output, selecting the main speaker or the earpiece (the speaker for the voice call). It is useful if you don’t have a headphone with you. OpusPlayer is compatible with most file explorers on Google Play. Moreover it provides a lot of features for managing your audio messages such as deleting, sharing and organizing, that make it the best audio manager for WhatsApp’s voice notes. SHARE THE AUDIO ON FACEBOOK: OpusPlayer is the only app that lets you share an audio as a Facebook post, a WhatsApp status or an Instagram story. CHOOSE THE AUDIO OUTPUT: you can switch your audio output between the standard multimedia and the voice call’s speaker. Use it if you have problems with the proximity sensor when using WhatsApp. USE IT WITH WHATSAPP: if you listen a voice message through Opus Player, the sender will not know you’ve listened it. 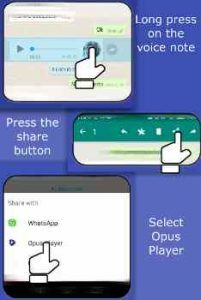 Just long press on the WhatsApp VNs, press on the share button and select Opus Player. WHATSAPP VOICE NOTES HISTORY: Opus Player takes a history of all your voice messages, received and sent through WhatsApp, and it shows them to you in order of date, giving you the possibility to easily find an old voice note and share it with other apps. ORGANIZE IN CATEGORIES: you can create a category, giving it a name and an image and associate to it all the audio messages you want. After created the categories, you can filter the voice notes choosing to show only those belonging to one or more categories. Moreover you can delete all the voice notes in a category with only one click. RENAME THE VOICE NOTES: you can change the name to each audio message without worrying about the compatibility with WhatsApp: the name is stored and shown only in Opus Player, without modifying the file, in order to avoid problems while running on WhatsApp. SET A TEXT NOTE: you can relate each vNote to a text note, maybe for summarizing the content of the audio or for taking note of who is the sender. SELECT THE FOLDER: you can manually select the folder in which Opus Player must search the .opus files. You can select the Telegram folder (Telegram\Telegram Audio\) as well. Just remember to select the “select the ogg files” option, because it uses the .ogg extension instead of .opus, and “use file’s date”, because it doesn’t save the date in the name as WhatsApp does. you can share the voice messages on the main social networks: create Facebook and Twitter posts, share on WhatsApp status and on Instagram stories. The Android Insomnia typeface is designed by Michael Moss (whitespirals.com) and the font is available via the Creative Commons Attribution 4.0 International License. Great app! WhatsApp suddenly decided it won’t play any voice notes, just get a “can’t load audio” error. This app is a great workaround, works perfectly! It works. Sometimes i dont want the person to know ive listend tp their vnote so i use thos app. great app! ive recently got an upgrade when i transfer all my whatsapp chats over and if i reinstall this app will they still appear and able to listen to them? Thank you for the feedback. 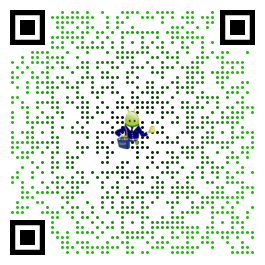 Unfortunately we can’t update the app for doing this. The problem is in “My File”. You can download another file manager from the Play Store. ES is one of the most used, or Total Commander, which uses few memory.